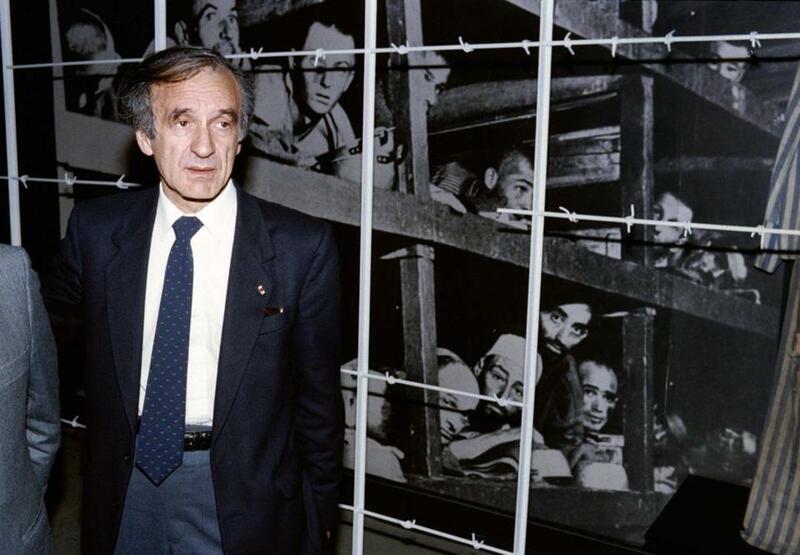 Nobel laureate and writer Elie Wiesel stood in front of a photo of himself and other inmates that was taken at Buchenwald in 1945. Rabbi Matthew Soffer grew up with Elie Wiesel’s voice. His childhood was infused with the teachings of the brilliant writer, philosopher, and survivor of the Holocaust. “I can’t recall the first encounter with his ideas or his literature any more than I can recall the first time I prayed,” said Soffer, of Temple Israel of Boston, one of the largest reform congregations in New England. Wiesel, a Nobel Peace Prize winner and a survivor of Auschwitz and other Nazi concentration camps, died Saturday at his home in Manhattan at age 87. As the world mourned his death, Wiesel was remembered fondly in Boston, his scholarly home for 40 years as a professor at Boston University. Elie Wiesel, who survived Nazi death camps to become an eloquent and unflinching witness to the Holocaust’s crimes against humanity; a prolific writer of novels, plays, essays, and memoirs; and a teacher, scholar, orator, and moral philosopher, has died. “His passing is a great loss,” BU spokesman Colin Riley said. Wiesel was the Andrew W. Mellon professor in the Humanities at BU since 1976. He was a member of the religion and philosophy departments until his 2011 retirement. The university created the Elie Wiesel Center for Jewish Studies in his honor. Wiesel’s passion for teaching, social justice, and his deeply held belief that the Holocaust should never be forgotten made him an influential and inspiring teacher for his fellow scholars and students. Michael Zank, director of the Wiesel Center, recalled the Literature of Memory class Wiesel taught. “It was an unbelievable experience [for students],” Zank said, who is also a professor of religion. Zank recently started working closely with Wiesel and last visited with him in New York a year ago. “He had the presence of someone who really takes you seriously,” Zank said in a phone interview Saturday. Ingrid Anderson, who teaches at the Wiesel Center, studied under Wiesel for five years while she was a graduate student at BU. She also worked in his office, she said. Teaching, she said, “was the most important thing” to Wiesel. “He was able to teach non-Jews that value of Judaism, and in that, he taught them to discover their own particularity, to honor our differences,” Anderson said. “We exchanged letters recently,” she said. “I guess that I was sort of feeling that I wanted to touch base with him,” she said. Wiesel is also being deeply mourned throughout the Jewish community in Greater Boston. “The world lost a great man, a great teacher,” said Israel Arbeiter, 91, of Newton, who, like Wiesel, survived Auschwitz and other camps. Arbeiter, the former 40-year president of The American Association of Jewish Holocaust Survivors of Greater Boston, said he met Wiesel many times. Wiesel, whose parents and sister were murdered in the Holocaust, seemed “very hurt, very wounded,” but also determined, Arbeiter said. But like Arbeiter, Wiesel believed the only way to prevent another holocaust in the future was to speak. “Let me tell you, having been an inmate of Auschwitz . . . Every day, thousands of people were brought in and gassed and cremated,” Arbeiter said. Wiesel was also remembered for his elegant, clear, and profound writing. “Night,” and Wiesel’s other books that described his survival of three camps, helped break the silence and shame many Holocaust survivors felt, Soffer said. “He paved the way for so many other stories,” he said. It is now up to a new generation of scholars to continue Wiesel’s work, Soffer said. “Now, we have to inherit and embody the very legacy that he fought so hard for every day,” Soffer said. Roger Brooks, chief executive of Facing History and Ourselves in Brookline, recalled Wiesel’s provocative prose. When he says, ‘The opposite of love is not hate, it’s indifference’ — in one very simple way, he’s made the world turn upside down,” Brooks said. Brooks is also the Elie Wiesel Professor Emeritus of Judaic Studies at Connecticut College. Brooks recalled a night about 20 years ago, when Wiesel was at his home on the Sabbath, and Brooks was about to sing the Havdalah, which are prayers that end the Sabbath. In the moment, Brooks said he was moved to share a few extra thoughts. Evan Allen can be reached at evan.allen@globe.com. Follow her on Twitter @evanmallen. Alexandra Koktsidis can be reached at alexandra.koktsidis@globe.com. Follow her on Twitter @akoktsidis.